Parkinsonism is a frequent neurological syndrome in adulthood but is very rare in childhood. Early forms of Parkinsonism have many distinctive features as compared to Parkinsonism in adults. In fact, rather than Parkinsonism, the general concept “hypokinetic-rigid syndrome” (HRS) is more accurate in children. In general, the terms “dystonia-parkinsonism”, “parkinsonism-plus”, or “parkinsonism-like” are preferred to designate these forms of paediatric HRS. 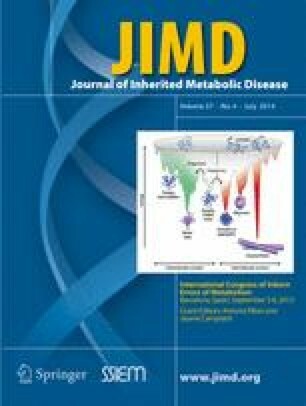 Inborn errors of metabolism (IEM) constitute an important group amongst the genetic causes of Parkinsonism at any age. The main IEM causing Parkinsonism are metal-storage diseases, neurotransmitter defects, lysosomal storage disorders and energy metabolism defects. IEM should not be neglected as many of them represent treatable causes of Parkinsonism. Here we review IEMs causing this neurological syndrome and propose diagnostic approaches depending on the age of onset and the associated clinical and neuroimaging features. Presented at the 12th International Congress of Inborn Errors of Metabolism, Barcelona, Spain, September 3-6, 2013. This study was funded by the grant FIS PS09/01132. Currently, Dr. Sofia Duarte integrates the Portuguese Programme for Advanced Medical Education, sponsored by Calouste Gulbenkian Foundation and Portuguese Foundation for Science and Technology.